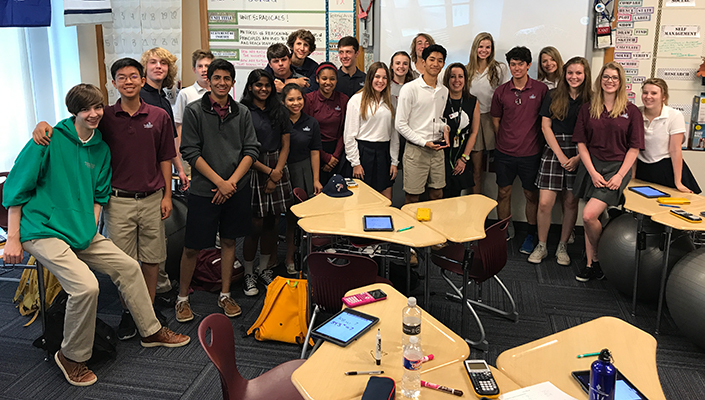 Westlake Academy Charter School in Dallas, Texas once again honored Middle Years Programme Algebra teacher Elizabeth Nairon as Teacher of the Year. Nairon was one of four finalists this year, and also received the award in 2016. 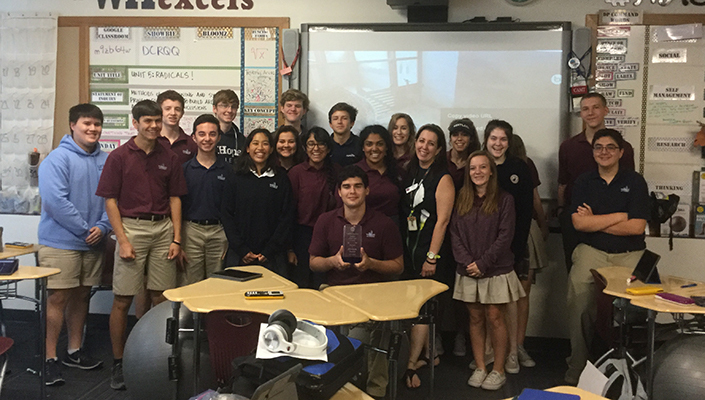 Westlake Academy has been awarding Teacher of the Year since 2013. A selection committee comprised of academic, IB, corporate, and community leaders from across the US reviews nominees and selects the winner. Nominees are scored on 30 characteristics based on the Academy’s Teacher of the Year rubric. Nairon received near-perfect scores in all areas of performance. 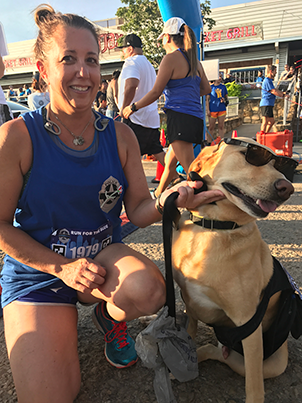 A long-time Showbie advocate, Nairon explains her philosophy on teaching, and what she feels contributes to her success in the classroom. EN: I am a secondary math teacher from Dallas, Texas. I have 3 daughters, a bossy cat named Boots and a goofy yellow lab named Beasley. Showbie: What brought you into the teaching profession? EN: Teachers are born not made! I always wanted to be a teacher in some capacity ever since I was little. I grew up overseas in Tripoli, Libya due to my dad’s job and that put me on my path to lifelong learning. My parents were passionate about travel and experiencing other cultures. Showbie: Congratulations on being awarded teacher of the year again! What are you doing in your classroom and school that you were teacher of the year not just once, but twice? EN: It’s ultimately all based in love! I am a lifelong learner – I love learning new things, and I love sharing my experiences with my students whom I love! When I become intellectually stagnant, I become unfulfilled emotionally and academically. I am a better teacher than I was last year, and definitely better than when I first started teaching. My experiences, both in and out of the classroom, have framed who I am today. Education and learning are never over when we leave the classroom at the end of a long day. The kinship to the world around us allows me to show my students the importance of learning and the joy of connecting it all together. The responsibility of not only teaching content, but helping in the formative creation of a global citizen is what drives me to always keep searching for the best delivery of curriculum, within the most current events of society and the needs of an international world and marketplace. I constantly read up on world events in order to tie our classroom content topics to the real world and strive to change things up yearly. We have flung pumpkins, dropped eggs, studied radioactive Japanese boars and designed security systems and ugly Xmas sweaters just to name a few. Then we have themed based viewing parties to celebrate their projects because teenagers love to eat! Why study math when you can live it? Showbie: What do you think makes a great teacher? EN: How can we teach vital skills to be acquired, sharpened, and polished if we do not model them ourselves? I have a very transparent approach to student work, and have set up parental access to all their digital files thanks to Showbie. I use social media to tweet out the students’ work using the #naymath to identify the work being done by my classes, in order for their parents, and the world of social media, to celebrate their projects like I do! I drove over an hour away to cheer on current and former students on both state basketball teams, and I attended every home football game this past year, as well as Fine Arts Day to show my students that I care about their success outside the classroom just as well as in it. I tutor twice a week (every week) for at least an hour to ensure students are reaching their highest potential, and I also tutor former students that are now in the DP and are struggling with the complexities of Pre-Calculus. I am just as awkward and emotional as the kids are at times, and struggle with the rigors of IB just as they do, yet together we keep pushing each other to do better, to be better, and to make sense of the world around us that lately seems to be scarier and more confusing than in recent past. We are all in it together! Showbie: What’s your favorite part about being a teacher? EN: I believe that my classroom fosters a safe place to not only achieve success, but also fail and struggle in a caring and loving environment that will ultimately provide an even sweeter victory on life’s journey of never ending learning. As a member of a learning environment, in a room of unique and talented individuals, I often learn as much as the students do! Through my love of learning and knowledge of my content area, I try to model the responsibility and attitudes of lifelong learning as well as also sharing my love of the power and beauty of math. High schoolers are complicated, passionate, silly and there are days that even the most confident ones are unsure and scared. I am blessed to be there to wipe tears, cheer on that first driver’s license, high five a job well done and watch them grow into their future. Showbie: What is the most important thing you have learned about integrating technology into your classroom? EN: Technology prepares kids for the future. We have kindergartners that will be using technology that hasn’t even been developed yet! Technology is dynamic and changes at a rapid pace; we need to prepare our learners to work in a global dynamic marketplace. In many industries, if you are not ahead of technology, you will be replaced by it. Technology in the classroom makes learning fun, promotes creativity and allows learners to work at their own pace. I make my own tutorial videos using Showbie and QuickTime. Students are able to go back and review the lesson of the day or use other resources to achieve mastery. Technology is not meant to replace more traditional teaching styles, but rather enhance learning and make it meaningful so that lifelong connections are made. Showbie: How does Showbie help you achieve your classroom goals? EN: I have to look at my feedback and evaluate, or reevaluate, that effect on students’ learning and achievement. Through my training on formative assessment and quick and timely feedback, I have found the dialogue to be honest and robust between my students and me; they are strong communicators when given the appropriate forum. My primary feedback tool is Showbie. Besides allowing us to go green and save a few trees, Showbie provides a platform for my learners and I to communicate through written or oral feedback. Showbie has a feature that allows me to leave a voice thread on their work as well as handwrite or type a note. As their daily work comes through, I am able to immediately check their status and circle any mistakes that are then allowed to be corrected. I was named a Showbie champion last year, and this year, as a member of the technology team, I have encouraged and tutored other WA instructors on the use of this app, and now many are using it across programmes. This allows for a uniform platform for students and a collaborative and uniform platform for teachers as well. Parents are also included in the workflow cycle and can also monitor their student’s work in real time. Showbie easily allows for differentiation and learners are able to access their previous work at any time. Showbie: What advice would you give to teachers starting out? 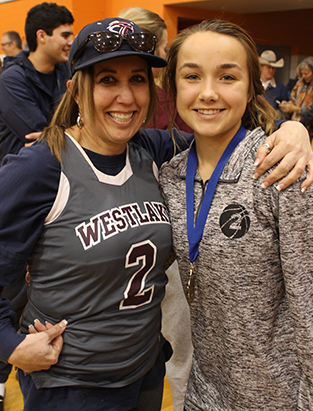 EN: I love my Westlake parents; they are incredibly supportive of their children, and are very strong communicators. I feel that we have a shared commitment to developing inquiring, knowledgeable, and caring young people who help to create a better and more peaceful world through intercultural understanding and respect. I would encourage new teachers to take the time to foster those relationships in and out of the classroom. I would also say don’t lose your balance. It is so easy to get caught up in work and emails and grading that you lose track of yourself. Be kind to yourself, allow yourself to fail, learn from your mistakes and never stop learning. Always walk with faith not sight!